Where am I today? Houston I suppose. I can't say for sure since I'm composing this in advance. But no fear. James Callan is my guest hijacker today and he's got everything under control. Can an author get in a rut? Absolutely. But, just a little thought and work can eliminate that possibility. I’ve had two books released in 2012. But if you think they are a series, similar, or came about in a similar fashion, think again. They were very different in production. In looking at how these two went from nothing to published books, you can see the many sides of writing. Two years ago, east Texas endured a rash of church burnings. The police were baffled. There seemed to be no motive, no connection between the victims, no significant robberies—although a few minor things were stolen from one of the churches. But eventually, two men were caught and because of the stolen items, the police were able to gain a conviction. But throughout, the police were unable to determine the motive. The men simple said, “We wanted to show we could get away with it.” And maybe that’s all there was to their motive. As with many people, this seemed like a rather poor motive. I began to wonder, what could be the motive for burning several churches. I dismissed the obvious choices, for instance a religious hater. And when I came up with a suitable motive, I had the plot for Cleansed by Fire. The second book came about a bit differently. Several years ago, our youngest daughter sang with a chorus of Sweet Adelines. (Sweet Adlines is the female version of the men’s Society for the Preservation and Encouragement of Barbershop Singing in America. These are women who like to sing the four-part harmony of barbershop. They sing a cappella. Sweet Adelines is an international organization and each year it holds a competition to crown the best chorus and the best quartet. One year, Diane’s chorus made it to the finals, so naturally my wife and I went to hear her group compete. The competition that year was in San Antonio, Texas. Her chorus came in fifth in the international competition. Diane writes YA books, mostly non-fiction. But after the competition was over, being writers, we naturally wondered how this might bring about some writing project. After awhile, we decided to write an adult murder mystery set in the glitz and excitement of an International singing competition. The result was Murder a Cappella. On Cleansed by Fire, I let the idea percolate in my brain for weeks. I decided against using a detective as the protagonist. Like those in east Texas, I wanted no clues left at the crime scene. Finally, I decided to let the only clue come to a priest in the confessional. Now, I had a real conflict for my new protagonist. He couldn’t tell anybody, not even the police. His information was that another church would be burned. He didn’t know which church, when, or by whom. What was he to do? Finally, he determines that nothing says he can’t look into the arsons himself. I sketched out the principal characters, developed a bio for them. Decided on alternate suspects and how they would be noticed by the protagonist. Added in something to counter the darker side. And then, it was sit down and start banging out a story. For Murder a Cappella, a few ideas were bandied back and forth between my daughter and me. I then took those and developed a plot and passed it back to Diane. She had many suggestions and we spent weeks revising, refining, tossing out, adding in, until we had a plot that we believed not only worked, but would not be obvious to the reader. We agreed that the reader had to be given a fair shot at determining the antagonist. But we also wanted enough twists that the avid mystery reader would not be able to get the right answer until our protagonist gave it to them. We developed character bios for principal players and sat down together and banged out a few chapters. Since we lived in different states, that approach wouldn’t do for the entire book. We decided she would take the first crack at chapters centered around the actual Sweet Adelines experience and competition. I would take the chapters centered more on the murder investigation. When she finished chapters, she sent them to me and I went over them, added in my suggestions for handling, pacing, dialogue, etc. When I finished a chapter, I sent it to her and she took the same steps on mine that I had on hers. Once we got to the end, we let it sit for a month. Then, separately, we each reviewed the entire manuscript and compiled a (long) list of areas for work. For the last pass, we agreed it had to be done together and I visited her home to iron out the final version. This was an important step so that the book would maintain a consistent voice. 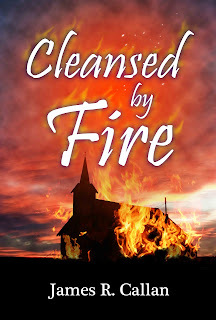 Cleansed by Fire was released and has received some very complimentary reviews and sustains good sales in both paperback and Kindle editions. At one point, it rose to number 22 on Amazon’s bestseller list for its category. Murder a Cappella has, at this point, only been released in paperback, but the publisher promised an e-book version will be out soon. It has been well received, sold well, and at one Sweet Adelines competition (not the international—that’s still ahead) all copies the publisher had sent were sold. I have finished the second book in the Father Frank Mystery series and started on the third book. I am expecting the second book to be released in 2013. 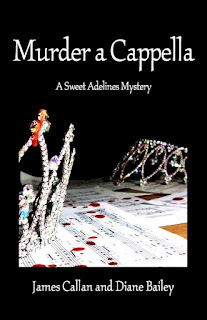 Diane and I have laid out the basic plot lines for books two and three of the Sweet Adelines Mysteries series. We have no contract on those as yet. I took a degree in English intent on writing. However, I discovered that one could not support a family as a beginning writer. I returned to graduate school, entering a Ph. D. program in mathematics. Writing was left far behind. After graduate school, I took a job at a research center and began a thirty year detour. Along the way, I received grants from the National Science Foundation, NASA, and the Data Processing Management Association, and gathered listings in Who’s Who in Computer Science and Two Thousand Notable Americans. Then one day I said, “I don’t have to support a family anymore.”All the kids were out of school, gainfully employed and raising their own families. So I returned to my first love, writing. I first wrote non-fiction books on the area I had been working in for thirty years. Finally, with a few books under my belt, I moved to mysteries, my real goal. My wife and I now split our time between Puerto Vallarta, Mexico and Texas. She is the consummate reader and I write. Yes, she is the first reader, and a critical reader, of my manuscripts. She has, under duress, written two short stories, one of which placed second in a short story contest. But, that did not excite her enough to continue. She reads. And we writers know that readers are very important to us. Excellent post James and good luck with your books. I have had two poetry books published and know full well all the processes it has to go through to get to the final result.....but it's worth it. Thanks for a most interesting read. You seem like such an eloquent writer James and I wish you the best of success in your books, Murder a Cappella sounds like something I'd really like to get hold off to read so this plug has definitely been worth your time. Unfortunately when it comes to me and writing my life has been in a permanent rut but it's good to see that things might end. Very different indeed! Must've been fun writing the book with your daughter. I took a long detour as well. Sometimes that's a good thing. It gives us time to percolate all the future stories we'll write. Congrats on your books doing so well. Now I'm curious about your church-burner's motivation. 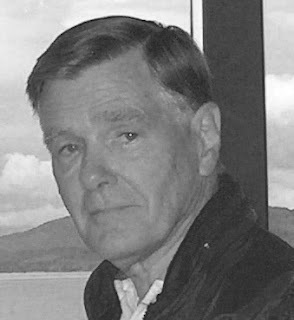 James Callan, I love hearing the paths your different books took. It shows that there's no one way to write a book. And the inspiration is endless. Yeah the different writes can be a task for some, but you just have to be able to turn on and off some parts of your mind. You are an inspiration for using life experiences and working them into book ideas. How wonderful to be able to work with your daughter on a book. I do think the empowering factor of involving your daughter on a book is a wonderful and no doubt, a cathartic and therapeutic endeavour. My best to you both and happy writing. Hmmm... Truthfully, I read nonfiction almost exclusively, but I gotta admit your 'Cleansed By Fire' sounds very intriguing to me. I may have to look into acquiring a copy of that. Very interesting. I always love hearing how writers get their inspiration! Nice to meet you, James. I love the way our ideas and books come to us in different ways. Interesting backstory to your novels. It was great to learn how you wrote and published them. Great post! I think most writers have taken some sort of a detour. Mine was about 20 years. I've often wondered how two people can write a work of fiction. It seemed to me that you'd spend the whole time disagreeing on plots turns and struggling to maintain one voice. It sounds like it gave you the best of both worlds rather than creating problems. Lee, I went to one of your sites and read your guest blogger, James Callan. I tried to tell him now much I enjoyed hispost but couldn't figure it out. So, if you see this, tell him for me. I hope to buy a copy of 'Murder a Cappella'. Jim is smart to "divide and conquer." In this competitive age of publishing, finding different readerships with a variety of genres is not only smart but profitable. Why lock yourself into one series; stand-alones can keep your name circulating while you work on the next book. How refreshing it must be to work on such totally different books, a great way to keep those creative juices flowing. Love your books, Jim. Keep going!! Terrific post, Jim. I really enjoy learning about authors and where their ideas come from, and how they take those ideas and make them work. Thanks for sharing! The Sweet Adelines obviously have a good sense of humor about inspiring a murder mystery. Good for them! I bet they're a fun bunch. And I like how one day you realized you didn't have a family to support anymore, and took up writing full-time. I'm at that time of life, too. Thank you for inspiring me. This is to all who have taken their time and effort to comment on my post. I'm still trying to figure out how to respond to each of you. And when I do, I will. For right now, let me say a sincere thanks to each and every one of you. And to those who spoke of writing with my daughter, I'll add this. At first, I was worried. Would two strong-willed writers be able to work this out? I had a very good relationship with Diane and worried that this might scar it. In fact, it was a wonderful experience. And while we disagreed here and there, we worked out each item and becmae closer. It was a great experience. Again, I'll try to respond to each of you - when I figure out how ! Thanks Lee, for the intro to James! Thanks, James, for sharing your insight. The books look great; will have to check them out. Thank you for a more definitive peek into not only your writing, but also into your family, your marriage and your life. I can only hope to one day collaborate with either of my sons, who are both writers but currently pursuing other careers to put food on the table (much as you had to do). What a joy it must have been for you to work with your daughter. Hi Lee - great post up by James and then reading about the collaboration with his daughter. Fascinating to read the process - I came across Barbershop singing via someone who was on a course with me - that got me blogging. I'd heard of the Sweet Adelines - what a great hook for a story ..